It's hard to believe it is already the end of August. Summer is winding down and Fall is kicking off. Fall always has us thinking about lighting.... although maybe we are always thinking about lighting! At any rate, we welcome Fall with a promotion from Philips. 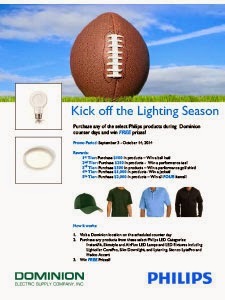 Purchase any of the select Philips products during their Dominion counter days and win FREE prizes! 1st Tier: Purchase$100 in products –Win a ball hat! 2nd Tier: Purchase $250 in products -Win a performance tee! 3rd Tier: Purchase $500 in products –Win a performance golf shirt! 4th Tier: Purchase $1,000 in products-Win a jacket! 5th Tier: Purchase $2,000 in products –Win all FOUR items!! Pick up the Featured Products from our website or visit any of our nine area locations to learn more. Good Luck!